Last night in Wickenburg was cold, it rained most of the night, and the wind rocked ol' Betsy like a cradle. I was up early and off to the parade, where I photographed non stop for about two hours, then to the Seven Bar Cafe, downtown, where I snagged a parking spot, for a lunch of fried chicken and mashed potatoes (an exception, but what the heck, it was cold and I've been behaving for days). By the time I finished lunch, it was time for the rodeo and another two and a half or three non stop shooting hours. It was so cold, and I'd been standing on uneven ground for so long, that when I turned to leave I could hardly walk, and must have looked like some doddering old man. And I'm not even 72, yet! 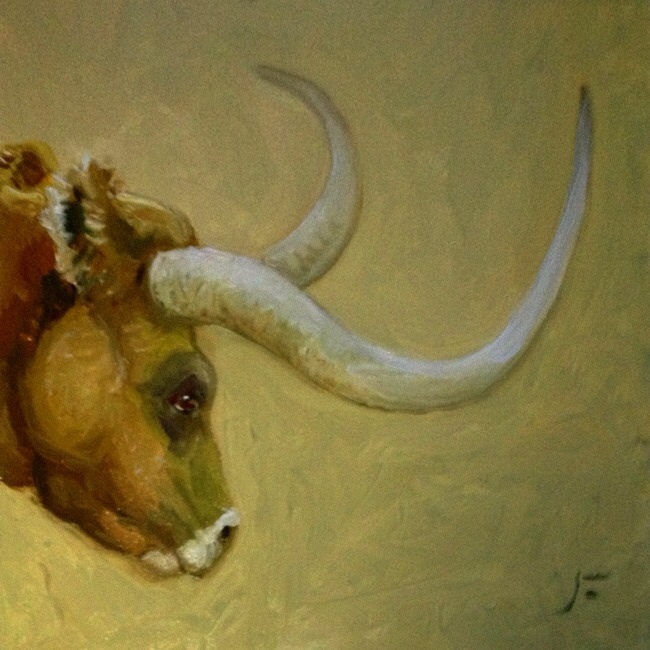 I reported right to Betsy and, because there was no time to download any of the day's research, I painted this Longhorn Study that I've been sneaking up on ever since I visited my friend and ace mechanic Austin Stockdale's place on the ranch in Victorville. Tomorrow is going to be a long day of catching up on image management, probably in the library, if it's open. Are you enjoying these daily paintings, photos and writings? If you are, please help us out by clicking on the Google+, Facebook, Twitter and other Icons below. Share us with your friends. And, by all means, leave a comment. Thanks. A quick, high-key study of a woman waiting in a restaurant. Just the sort of thing you might make brief notice of while waiting, yourself; people watching, your mind on other things. Today started off clear and sunny. It seemed it would be that way forever, in spite of the fact that the first thing I saw when I woke up was snow on top of San Jacinto, that mountain that has long been a favorite of mine. Around noon, dark clouds started rolling over the mountain. My friend, Jay Olson, came out from LA around 1:30, and we met in the parking lot of the Palm Springs Art Museum and walked over to Palm Desert Drive for a Mexican lunch. Later, we returned to the museum for an exciting show of Navajo Textiles. 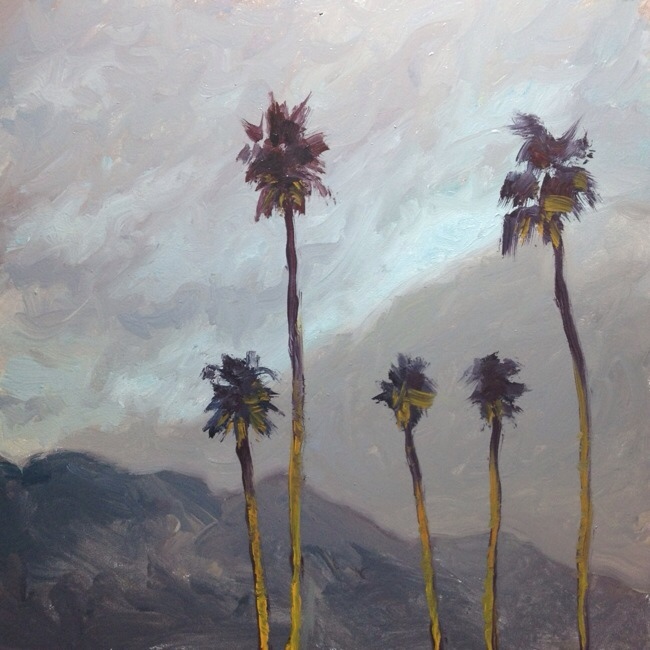 As we exited the museum, the sun had just set, there were small patches of pale blue sky showing through the still rolling clouds, and there were palm trees silhouetted all around us. Set against the sky and with their trunks illuminated by the lights of the city, they were just more than I could resist. I decided to roll the dice and see if Betsy's battery could handle my Ott light. It did, and I painted today's painting right there in the museum parking lot. This thing with the palm trees is fast becoming a new little series. One of these days I'll have to stop and count all the series I have going. Last night, after the film, I finally said goodbye to Riverside and the Mission Inn. I set my Motion X Drive GPS to avoid freeways, and it led me through San Timoteo Canyon on a lovely, winding two lane road lined with ranches and horse properties. I hope to some day go through there in daylight. About half way through the canyon, I encountered a herd of eight to twelve burros on the road. I stopped in Banning to write my blogs, then drove on in to Palm Springs, where I posted them. 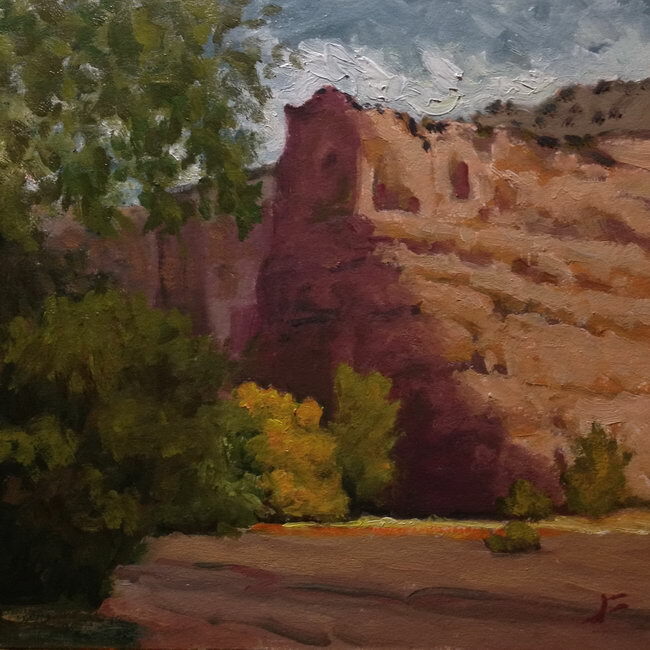 Please remember that if you would like to commission a larger version of your favorite subject, if you would like to check on the availability of a given image, or if you would like to schedule a workshop, we are just a phone call away, at 505 982-4561, or you can email us at: farnsworthgallery@newmex.com. There are giant, white wind generators, or as some would have it, bird choppers, all atop these hills, now. 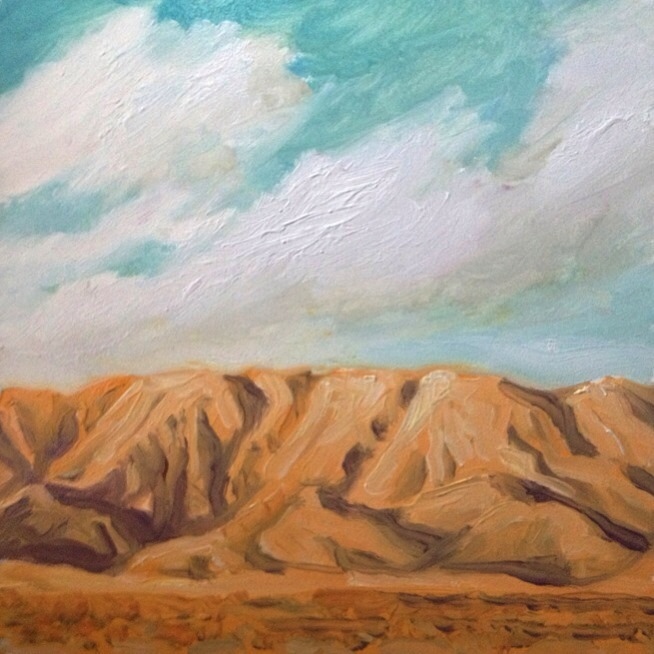 I chose to paint this little study of the hills as i remeber them from previous trips between Palm Springs and Los Angeles. I don't know enough, yet, to take sides in the argument for or against these modern windmills, but the hills are equally as interesting with or without them. Maybe I'll include them in another painting someday. Most of the day was spent attempting to resolve the issues with my email. Not much luck, so far. Will try again tomorrow. Wish me luck. 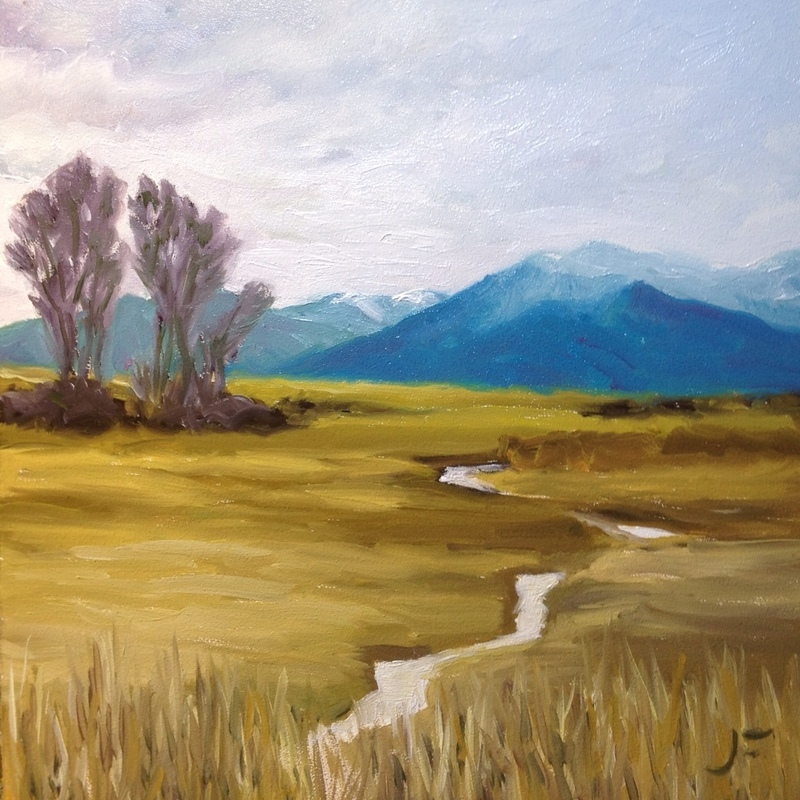 An acequia is an irrigation ditch. It carries water to the fields in and around Taos, as well as serving as a focal point for the social life of the community. We had a nice, leisurely start this morning. Breakfast at La Posada, followed by photographing around the hotel and the town. We then drove straight through to LakeHavasu City, with a couple of brief stops for photography. LHC was packed, so we drove on to Parker, where we got a room, had some dinner and turned in. 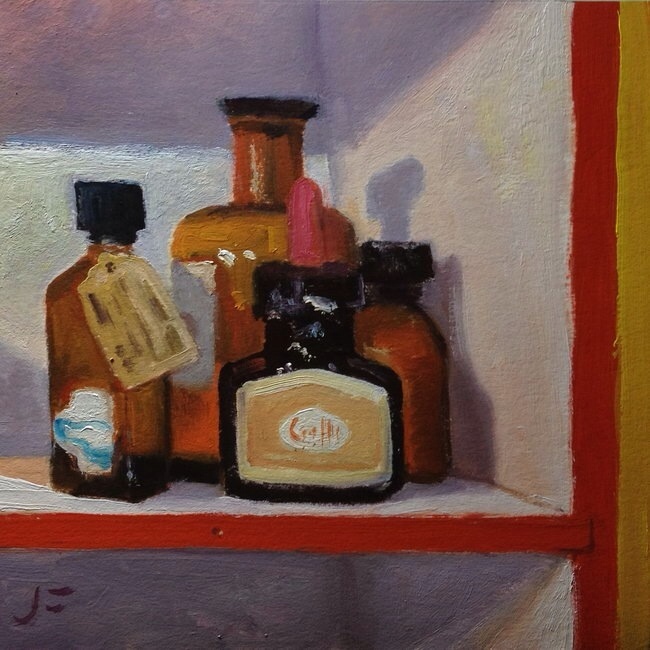 Old bottles. A great excuse to play with colors, textures, shapes and shadows. These were in a four shelf unit full of odds and ends in an antiques mall in Riverside, California.